High water and run-off close a few opportunities for fly fishing moving water, but opens up the chances of fly fishing still waters. I grew up on mountain lakes and fly fishing still waters. I absolutely love it and always look forward to fishing and guiding the glass. Back in May I took a trip to Arizona to present to a few clubs (Arizona Fly casters and Desert Fly casters) the Systematic Approach to Fly Fishing. Some of you may not know that I am originally from AZ and remember the fly fishing more than I remembered the heat. One hundred eight degrees in Phoenix one day! So, I was overjoyed to travel up to the White Mountains, where I cut my fly fishing teeth on lakes, for a bit of lake fly fishing. We arrived at Becker Lake, near Springerville, AZ, at around noon. The boys (Gentry, Joe, and John), were gracious enough to outfit me with a pontoon, booties, and fins. 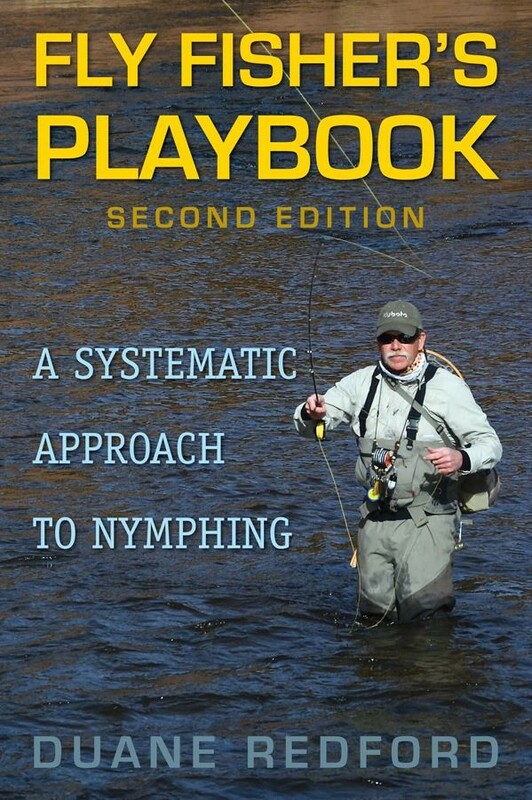 I was fixated on dry fly fishing first, running streamers secondly, and nymphing as a last option. Not that I don’t make a living fishing under a bobber or I have anything against it, but I wanted dry fly or streamer action, because I don’t get to do too much of that. I can never get too much of that! Well, there were very few fish eating on the surface. I could see size 18 chironomid adults sporadically hatching, but couldn’t raise a fish. After about an hour of that, I switched to a tandem streamer rig. I threw a black slumpbuster on a jig hook in front of John Rohmer’s simi leech (black and olive). No love on that rig either. I could see the writing on the wall, nymphing time. Now these guys are running 18’ leaders and break-away indicators, with trolling motors and fish finders. Pretty serious individuals. I thought I knew how to rig a break away indicator, and had picked up a few before leaving Colorado. I couldn’t find the dang things in my waist pack, and finally asked for help getting that thing rigged. I put on as close to matching bugs with what I could glean from the few guys that were hooking up, but soon realized that my formula left much to luck. Soon, I took off the indicator, loaded up weight and fished it “Czech-style” right on the bottom. I did have a couple eats, which I completely missed, but I did move fish. Mercifully, the wind got big, and I got to cruise to the dock. Not that I didn’t have fun, but I always like to feel I’m in at least a smidge of control. I met my nephew on the way to the evening’s festivities as I cruised back toward Pinetop, and watched him fish for Apache and brown trout on a small stream that I don’t know the name of. He moved more than a few on dry dropper rigs. I felt a little better. That evening, as I lay there listening to my brothers dog snoring, I realized I needed to fish to my strengths tomorrow on that lake. The White Mountain Lakes Foundation was hosting an annual event that raises money for the organization, which in turn, helps the organization support and enhance the fishing in the White Mountains. I was honored to be a part of it. 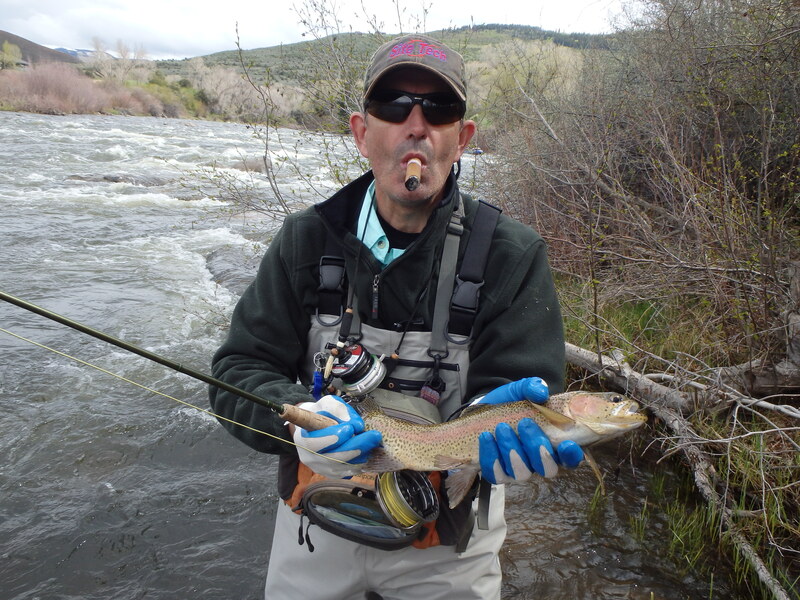 I was up early the next morning, drinking a cup of coffee and puffing my pipe, in front of a 7-Eleven, rigging a double dry rig consisting of a Royal Wolff followed by and adult chironomid pattern matching the adults I saw earlier. My plan was to go back to my roots and walk the edges early morning looking for and casting to rings and noses. I had just thrown on my waders, when a gentleman named Mike came up to me and Gentry and said, “There are fish coming up on the far end”. “Where abouts?”, I asked. He pointed to a spot that was maybe a five minute walk. I was there in four. I stood for a moment watching the action and planning on how to fish to these noses from near to far, trying not to spook them. First cast….bam, fish on! What? Tiger trout? “Oh this is even gonna be better than I thought”, I mumbled, as another fish ate my second cast. Mike had put me on a pod of small tiger trout on the munch. He eventually showed up, and I thanked him for the intel again. We both moved a few more (I snapped of a big one) and then it was time to head back for more festivities. High river water offers the opportunity to seek out still water. If you don’t fish it often, there is an adjustment period. Go back to your roots, do what you do well and have confidence in. I do want another shot at deep still water nymphing techniques because the systematic approach works well there too. I always say that folks should fish to their strengths while working on their weaknesses. Someday I’ll get back there better armed with information and techniques and flatten out that weakness. It’s all part of the process of becoming a complete angler. In the meantime, Fear No Water! My client hooks a beauty of a brown in a soft seam about fifteen feet out. The river is in pre-runoff, so there is a dangerous element to landing big fish that get into big water. I bark a few directions about rod tip angles and height that puts my client in good fighting position. The brown took exception to it. Off she goes! The reel is screaming as she burrows deep into the hard water across the river. The downstream bow in the fly line is tremendous as the fish is jumping upstream and across from us. I’m thinking we’re screwed. Somehow we manage to keep our ground and get half of our fly line back. The trout is back in the same seam we hooked her in. It’s our move. I instruct to move downstream a bit to maintain at least a ninety degree angle on the beast. We set our feet, but realize we will be moving soon. 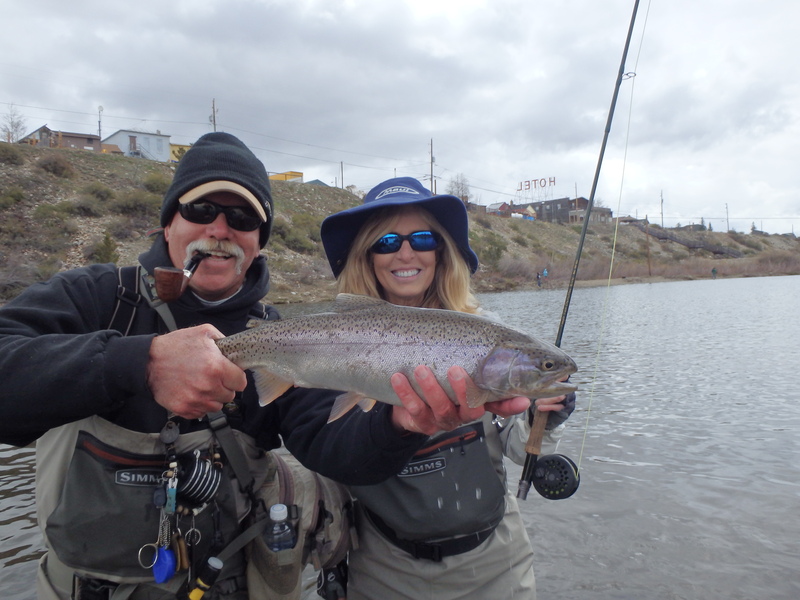 Client lifts the rod a foot or so and increases tippet pressure on the fish. Reaction generated and the fish is ripping off line downstream. We strive to keep up. At some point, I know I’m going to have to let go of my clients wading belt, stop dragging him along the rocks at river edge, and go in for the beast. We top out on a small sand point, and I exclaim that we will live or die from this point. It sounded good when I said it. The beast is now forty feet downstream swimming in and out of a nice eddy. “Perfect”, I think as I claw my way through the willows waist deep in the drink. As I near the spot where I think we have the best chance to bag, I realize it’s simply too deep to be of much help. The fish is in the soft flow, finning up and down, a mere seven feet away. 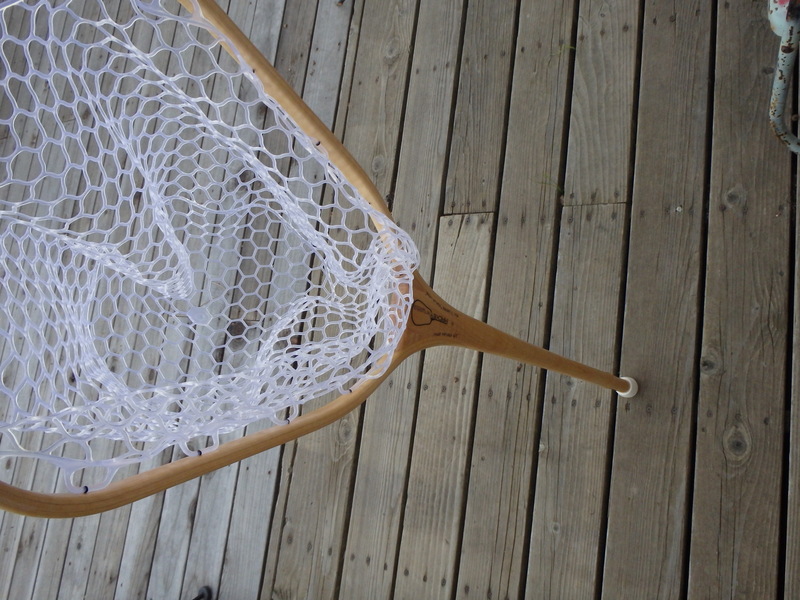 Problem is adding together my arm and net length, I come up about a half foot short. Where have I heard that before? I’ve no choice, I have to make a plunge move out to this fish hoping to bag it before it bolts downstream into a class four rapid. Here goes nothing. I felt her tap the outside of the hoop of my net as I went under water. I came up kicking and spitting….Fishless. She broke us off in the heavy stuff downstream. I bought a new net. My old net was perfect for most seasons, but run-off on the Eagle ain’t one of them. Handle is just too short. I contacted Kevin Mackey of Mackeynetworks and we designed a new bag. Obviously, the handle is longer, but there are other features as well. 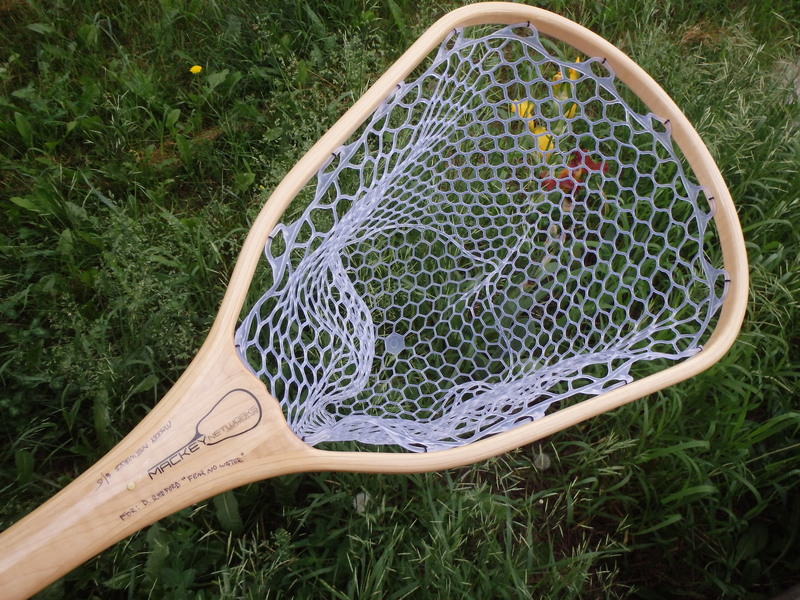 I use this net as a wade staff as well. 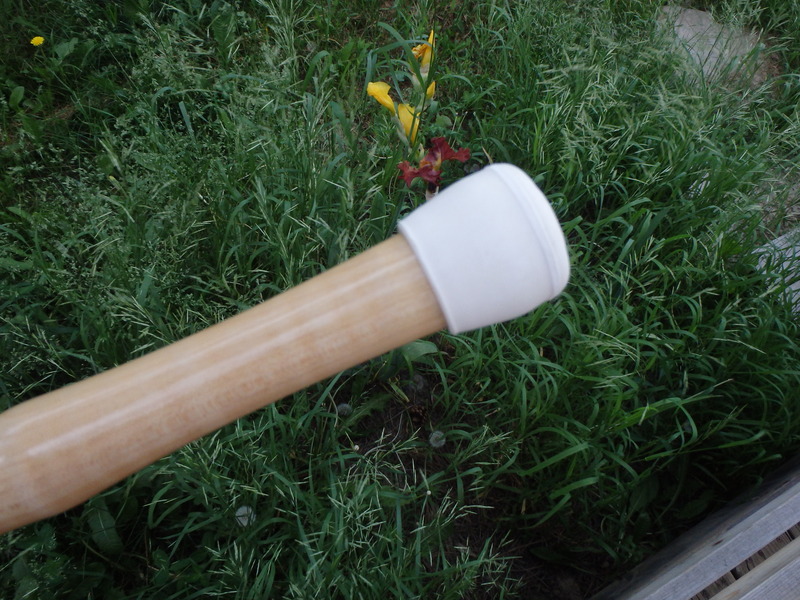 I had Kevin turn the end of the handle to about an inch diameter, and I placed a walking cane rubber stopper on it. The rest of the net is surprisingly light for the beefy ability to support my weight fully. The hoop is large enough to bag the beasts of the Eagle, but not too obtrusive to carry. The wood and finish are beautiful. 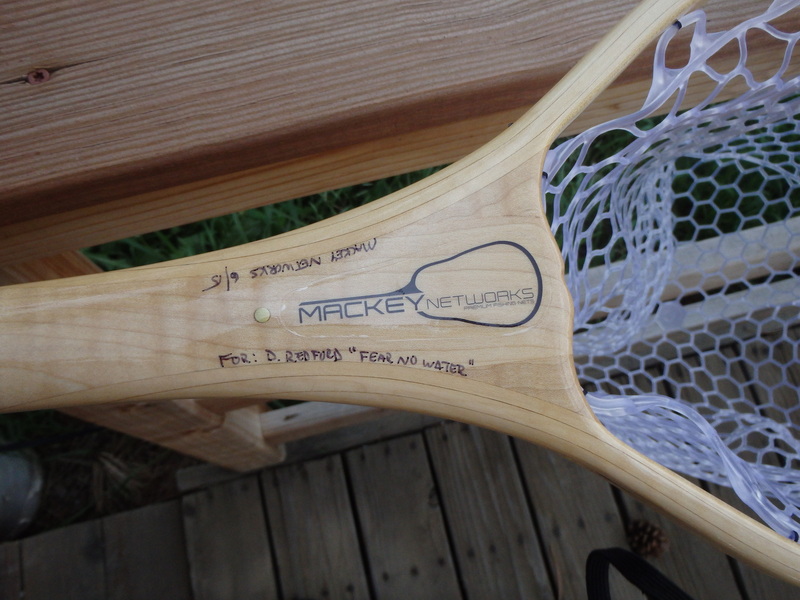 I don’t rep for Kevin, but if you want one of his nets, go to mackeynetworks. If you can’t find him, contact me and I’ll get you hooked up. So glad May is finally nearing June. I traveled a bunch giving presentations in Colorado and Arizona. I’m not much for hotels and rental cars, but I do enjoy speaking to various groups. I spent 2 days in Tucson, 3 in the Phoenix area, and 3 in east-central Arizona’s White Mountains. Big groups of “fishy” folks. The Arizona folks spend most of their fly fishing days raking the still waters. They float-tube or bank/wade fish the mountain lakes for trout and pike, and do the same on lower elevation lakes for large and small mouth bass. Fly fishers in Phoenix talked about catching carp in the urban irrigation ditches or chasing them in the warm shallows on lakes. My presentations, thankfully, were well received, but it was interesting watching my focus spin from moving waters to still waters. 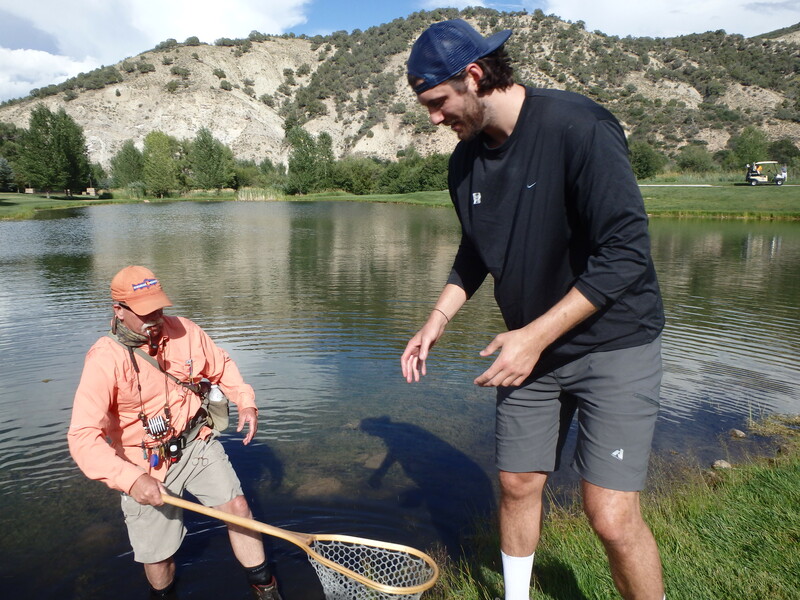 Although my latest book has a section on fly fishing lakes, I don’t spend a bunch of time talking about it in Colorado. I only fish lakes once or twice a year anymore and going back to my Arizona roots, made me realize how often I used to fly fish lakes. Interestingly enough, it’s still forms the basis of one of my main theories of fishing. It’s all about depth, speed, profile, and color. I can’t say it enough; those basic tenets of fishing are of utmost importance. Notice how I say basic tenets of fishing instead of fly fishing? After much thought one night after a presentation in Tucson, it hit me that all fishing requires attention to depth, speed, profile, and color. Even a kid drowning a worm under a bobber must pay attention to those basic tenets! Streamers, dries, dry-droppers, nymphing, lures, salt, bait…..It’s all about finding feeding fish levels, speeds of the lure, flies or bait that feeding fish are eating, and the proper profile and color of the food fish are feeding on. Makes me think of the old cartoon of the fish in the restaurant complaining to the waiter that there is a fly in his soup. The first time I saw that I wondered where the fly was depth-wise in the bowl. At the bottom? Suspended somewhere in the middle? On top? It makes a difference where that fly is, because then I’d know at what level in the “soup” that fish is feeding. That may sound silly, but my main concern when I approach the water (river or lake) is where in the “soup” are those fish feeding? Get those bugs at that level first, and then dial in your speed (weight), profile, and color. Find the level of the feeding fish! Often it’s observable. When it’s not, then you have to systematically dig thru the soup til you find the level. I usually start at the bottom of the soup and work my way up til I find the feeding zone. If I’m not hooking as many fish as I think I should be, more than likely my depth is off, provided I have the proper speed. I am convinced you can throw the wrong flies at the correct depth and speed and hook fish. The converse is not true, the perfect bugs at wrong depths and speeds does nothing but allow you to work on your backcast. The next time you hit the river or lake of your liking, take a moment to really discern at what level the fish are feeding. You’ll have already won half the battle even before you start fishing, and oh yeah, pass the crackers, please. Bob with another fish using more conventional fly gear. Father’s Day is coming, get a copy for your favorite Dad! Client using a nymph rig in still water to produce a nice bow. 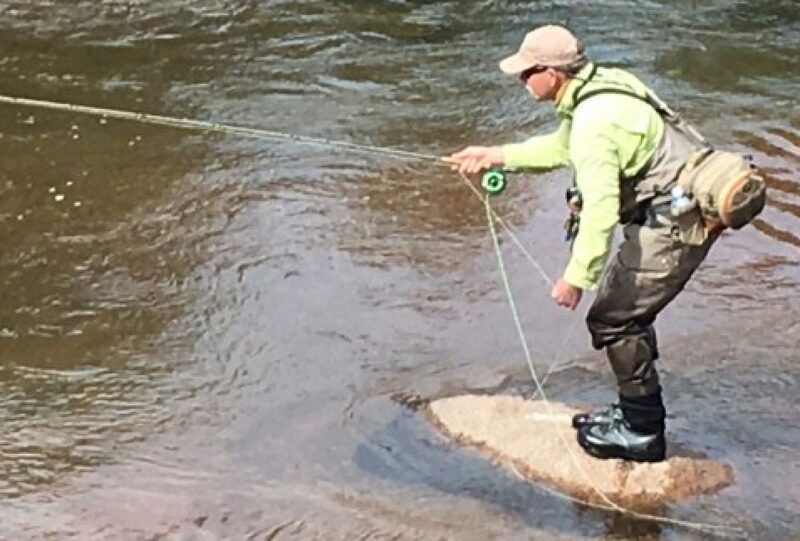 Bob Long using Tenkara to find the proper depth of feeding fish. Fun to guide a guy using this method. “Did you hear that?” My client says, “Hear what?”. “I thought I heard a fish eat on the surface downstream to our left”, I reply. “Nope, didn’t hear a thing”, he says. This conversation, and many like it, happens often while I’m guiding. Fly fishing is mostly about sight. Being able to see what is happening while following an indicator or dry fly is easy. It’s directly observable. The ability to “feel” underwater and hear peripheral happenings on the surface is the next step in becoming an accomplished angler. 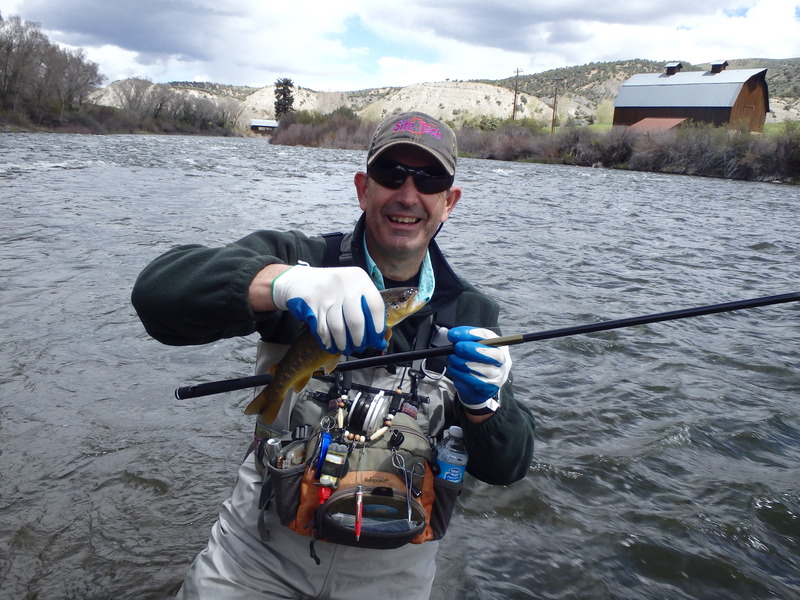 I find the best anglers, fly fishers, are those that have the whole package. They can pick up several clues about what’s going on around them while concentrating on the “sight game”. The ability to multi-task while getting great drifts is paramount because it helps you “see” what’s going on around you. Seeing adult bugs fluttering over the river is important, but hearing fish eat on the surface without a visual clue is deadly. Also, the ability to discern by sound how the fish are eating on top, and the ability to make appropriate changes to your rig, without a visual clue is huge. 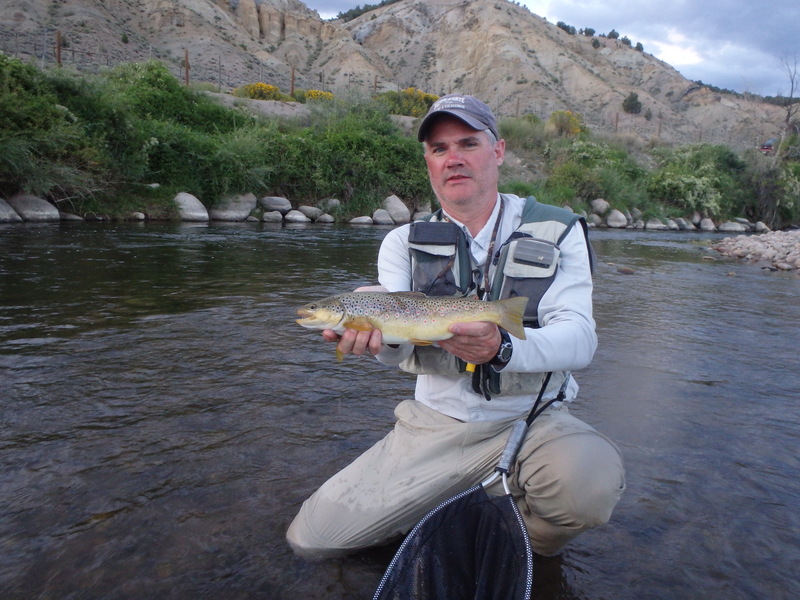 One of the best days of fishing I ever had was on the Arkansas River near Salida, Colorado, during a caddis hatch. During daylight hours, it was easy to see my offering and the subsequent splashy takes on the surface. Where it really got fun was when the sun went down and I continued to fish in the dark throwing dry caddis imitations to eager fish. Having a general idea of where your flies where in the drift, and setting on the sound of the fish eating, was an absolute blast. I think that day went a long way in teaching me how to dial into a river without being able to see. 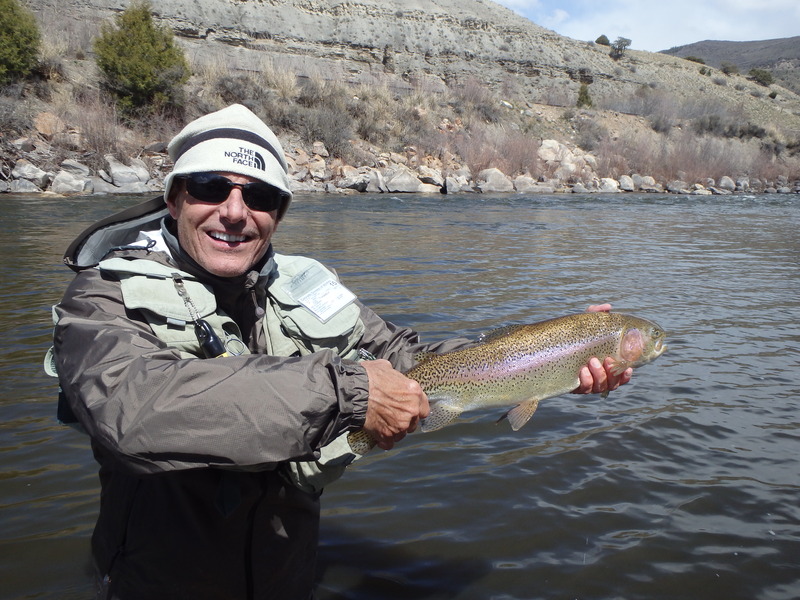 I have done it several times since on various rivers in the Rocky Mountain West. If you do it enough, you can tell the difference between a sip, a flush, and a splashy take. Splashy takes are easy to recognize, but sips and flushes aren’t so easy to discern. Splashy takes are a good sign that trout are eating Caddis, Stoneflies or other bugs on the surface that skitter, skate, or hatch in one fluid motion. Sips signify fish that are eating duns, spents, or cripples on the surface in a peaceful cadence. You have to really listen for sips, but I often hear those before I see them because the fish may only expose a nose and part of their back. Flushes are fun. For those of you that have ever thrown mouse patterns in the dark, you know what I mean when I talk about a flush eat. It’s the sound of a fish attacking something on the surface. Usually, it’s a big fly eaten by a big fish. It’s a large circular take with an unmistakable sound. Often times, I will hear a fish eat on top, and quickly look in that direction for the telltale ring or floating air bubble that shows broken water surface. At this point, using my experience and sight to determine which flies are hatching comes into play. Figure the type of take, where the fish ate, and finally the adults that are hatching, to formulate your plan and next move. The other sense I mentioned earlier was feel. 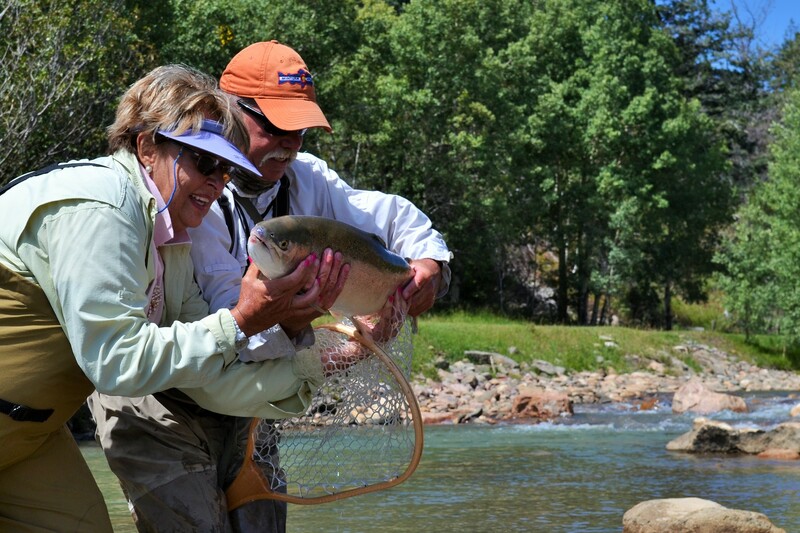 In most fly fishing situations, the “feel” comes after the hook-up. If I’m Czeck nymphing, feel is a sense that comes in handy as there are very few visual clues that tell you when you have a fish eat. Sometimes when fishing soft hackles under and indicator you also get to feel the fish eat on the swing portion of your drift. Another chance to feel a fish eat is when you’re chucking streamers. Streamers and Czeck nymphing are unique in that you can not only feel fish takes, but you can feel the water. You feel differences in water speed, depths, and hydraulics. In other words, you can feel without seeing what’s going on with current sub-surface. It’s pretty cool, and will teach you volumes of information that you can apply to all disciplines of fly fishing. As a guy that’s bow hunted nearly his entire life, I’ve learned what it takes to get close to game to seal the deal. A lot of my successes have come from secondary senses. 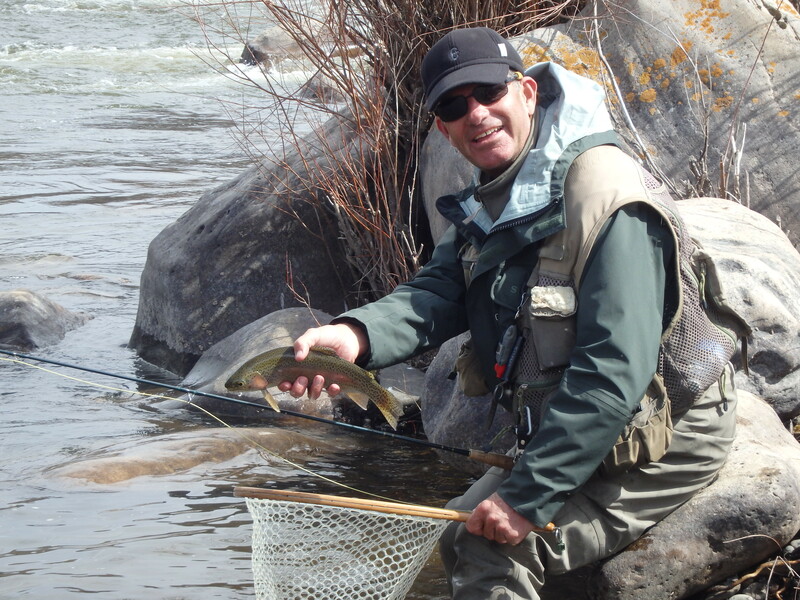 Although I rely on sight predominately, I am constantly striving to bring my other senses into play as I fly fish. Give it a try! My sense of smell tells me dinner is ready……Fear No Water! Let the force be with you….